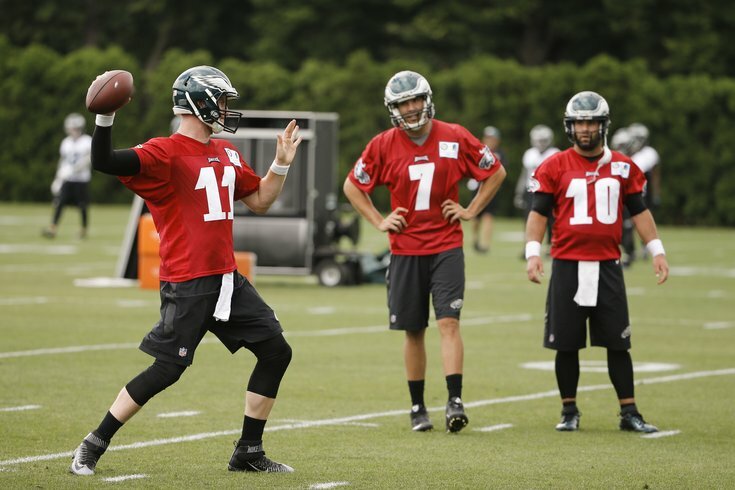 Carson Wentz is getting equal reps in practice, but he'll probably be watching in street clothes during the regular season, initially anyway. Ever since the Eagles selected Carson Wentz with the No. 2 overall pick, they've made it clear that they want to be extremely patient with him. Wentz is a player the Eagles view as the long term centerpiece of the franchise, but not in any way some kind of short term fix. They're so dedicated to their patient approach, in fact, that Wentz probably won't even be active on game day initially, according to head coach Doug Pederson. This is something we covered at length in June. This offseason, the Eagles handed out lucrative contracts both to Sam Bradford and backup Chase Daniel, before drafting Wentz. They've also repeatedly stated that Bradford is the starter in 2016. In a best case scenario, the Eagles would love to be competitive in 2016 with Bradford having his best season as a starter (not a high bar). That will make it easier for Howie Roseman to flip Bradford for a decent draft pick during the 2017 offseason. Meanwhile, Daniel's role feels a lot like he is the long term backup, first for Bradford, and then for Wentz whenever the Eagles deem Wentz ready. During OTAs and minicamp, Wentz had some very impressive moments, making plays that Bradford and Daniel could never make. Other times, he looked like a rookie as you would expect. If indeed Wentz is inactive Week 1 against the Cleveland Browns, there is sure to be outrage that the Eagles are letting the No. 2 overall pick in the draft collect dust on the sidelines. There shouldn't be. The Eagles are in a situation in which they have two competent quarterbacks already on the roster. On a team that is highly unlikely to compete for a Super Bowl this season, what's the rush?